Action from Posh v West Ham in July 2015. Photo: Joe Dent/theposh.com. Peterborough United will again host a West Ham XI in the close season. The match will take place at the ABAX Stadium on Tuesday, July 19 (7.30pm kick off). Last summer the teams drew 3-3 when Posh fans received their first glimpse of Martin Samuelsen’s talent. Posh will open their pre-season campaign at Conference North side Boston United on Saturday, July 9 in a match that will serve as a testominial for long-serving Pilgrims secretary John Blackwell who is retiring after 38 years at the club. Posh have also announced a friendly at Southern League side Histon United which will take place on Tuesday, August 2. 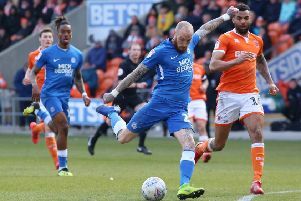 Posh will play at National League side Boreham Wood on Monday, July 11. Ticket prices for this games will be announced in due course alongside a number of other friendly fixtures. Posh players return for first-team training on June 27 and head straight to Portugal for a six day training camp. The League One fixtures will be released on June 22. Saturday, July 9 v Boston United (away). Monday, July 11 v Boreham Wood (away). Tuesday, July 19 v West Ham (home). Tuesday, August 2 v Histon United (away).